Banas basin which is the largest, drains out 45,833 Sq km. Luni basin, which comes next, drains out 37,363 Sq km. 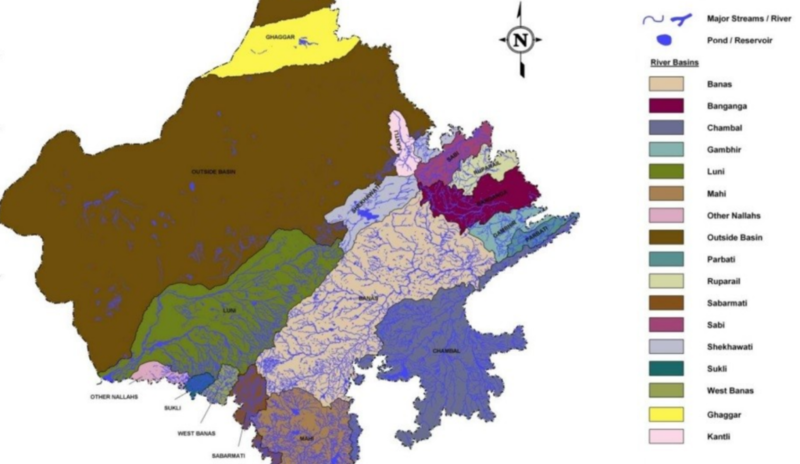 Chambal basin drains out 31,360 Sq km. Mahi basin drains out 16,985 Sq km. Banganga basin drains out 8,878 Sq km. Sabarmati basin drains out 4,164 sq km. There are more rivers like Sahibi, Ruparel and Ghaggar which have smaller catchment areas besides several streams which feed the bigger rivers. Banas Basin – Banas, Berach, Dain, Gudia, Kalisil, Khari, Kothari, Mashi, Morel, Sodra. Luni Basin –Luni, Sukri, Rediya, Mithri, Bandi, Khari, Jawai, Guhiya and Sagi, and Jojari. Chambal Basin – Banas, Chakan, Chambal Downstream, Chambal Upstream, Kalisindh, Kunu, Mej and Parwati. Mahi Basin– Anas, Bhadar, Jakham, Moran, Som and Mahi. 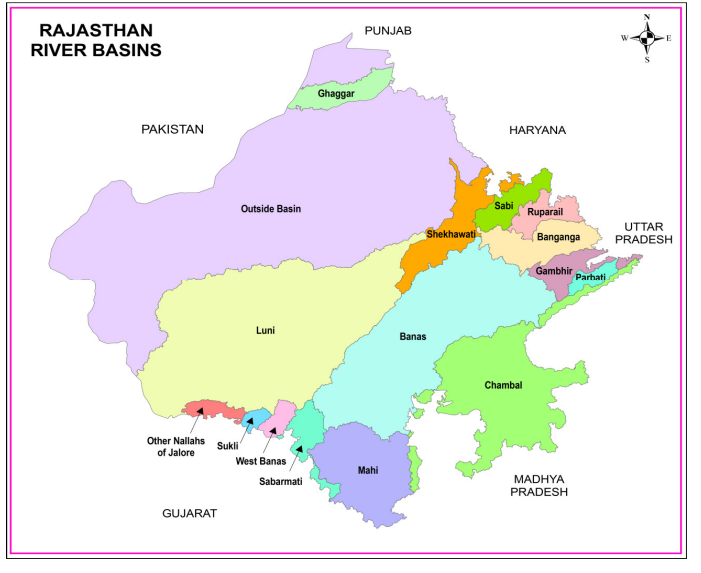 In October 2015, the Rajasthan assembly passed the Rajasthan River Basin and Water Resources Planning Bill, 2015 by voice vote. The bill sought for the establishment of State Water Resources Advisory Council and Rajasthan River Basin and Water Resources Planning Authority for management and development of river basins and sub-basins on sustainable basis on integrated water resources management (IWRM) concept.